St. Landry Crime Stoppers started in St. Landry Parish in 2007. The popularity of St. Landry Crime Stoppers has rapidly spread throughout St. Landry Parish and Acadiana. This is due to the media exposure the program receives. Each week KATC TV 3 comes to St. Landry Parish to film an unsolved crime as the CRIME OF THE WEEK. The program is aired at 6pm and 10pm each Wednesday on T.V. 3.The other TV stations also air the crime of the week, as well as all local newspapers, including Lafayette and Baton Rouge. Radio stations, KSLO, KOGM, KEUN, KBON, KVPI, and KPEL air the crime of the week on their respective radio stations throughout the week. You can log on to our site on the web by going to www. stlandrycrimestoppers.com. On the left are several links to view along with a link for sponsors. St. Landry Crime Stoppers would like to know if you would be interested in sponsoring our program. Your company name would be placed in the sponsor section. Prior to the crime of the week on radio stations, a recorded message would direct listeners to the sponsor link and encourage them to click on the sponsor link and support the business’ that supports St. Landry Crime Stoppers. 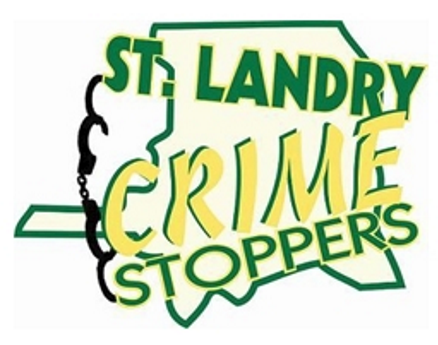 We are also have a Facebook account under the name of St. Landry Crime Stoppers. I do a lot of speaking engagements throughout the parish at schools, Rotary, Kiwanis, Neighborhood Watch, just to mention a few. Each time I will encourage the audience to click on the sponsor link and patronize our supporters. This is a great way to give both of us exposure to the public. For a $25.00 per month fee, your company name will be placed on the sponsor link. Your contribution is tax deductible. If you pay twelve months consecutively without missing a month, we will give you the next month free. Please take a few minutes and check out our web and Facebook account. If you are interested in becoming a sponsor contact Sheryl Badeaux, the St. Landry Crime Stoppers Office Manager at 337-942-7075.